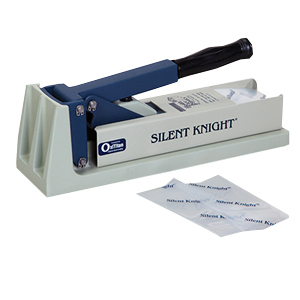 The Silent Knight® provides very quiet, yet powerful crushing of tablets into a fine powder. Protected by OxiTitan anti-microbial Coating. Proven effective against MRSA, C. difficile and other bacteria, viruses, molds and fungi. Augments facility's infection control protocol. Green Technology - made with eco-safe ingredients with no toxic chemicals or pollutants. OxiTitan bonds to the crusher - will not come off during normal use or cleaning. Tablets are crushed in durable Latex-Free polyethylene (7 mil) pouches that hold tablets in place during crushing and help prevent cross contamination. Tablet Crusher Pouches will hold and crush up to five tablets (depending on the size of the tablet). The Silent Knight® is latex-free and made of aluminum. Storage compartment at the end holds crusher pouches.